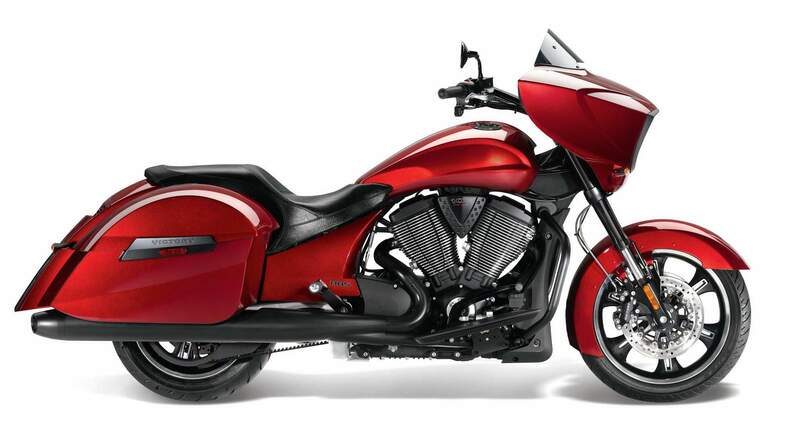 The Victory® Freedom® 106/6 V-Twin is a 106-cu. in. powerplant that pumps out 106 ft-lb of arm-straightening, street-churning torque. It’s a counter-balanced, fuel-injected engine that delivers impressive performance for riders who like to lead, not follow. A Cross Country rider enjoys smooth shifting and the best cruising on the open road in 6th gear, which is a true overdrive. Helical-cut gears ensure that each shift is smooth and easy, and neutral assist makes it easy to slip into neutral at stops. In all conditions, the Victory Anti-Lock Brake System on the Cross Country provides riders with peace of mind. When traction is compromised, it immediately and automatically provides reliable braking to help a rider stop quickly and under control. Out on the open road, go ahead and activate the cruise control for an easy, relaxed ride. This automotive-qualify cruise control is easy to activate and set, and it reliably maintains the desired speed. To de-activate it, simply press “Off” or engage the clutch lever or either brake. The Cross Country is ready and rated for 2-up riding with any cargo needed for a crosstown run or overnight trip. It has the power, cargo space, comfortable seating and adjustable air shock rear suspension so one or two riders enjoy the best in cruising. Roomy, convenient, weatherproof and lockable. The Cross Country saddlebags set high new standards for carrying riders’ essential gear. Cross Country saddlebag lids can be opened easily with one hand, they latch securely, have weatherproof seals and are lockable. Sometimes the open road gets a little rough, so it’s great to have the 4.7” of smooth travel provided by the Cross Country rear suspension. The air shock is easily adjusted using a hand pump so the suspension delivers a consistently smooth ride for one or two riders, with or without cargo on board. Put the color-matched Lock & Ride® Trunk at the top of your accessories list. Victory-exclusive Lock & Ride technology means this trunk can be installed or removed in minutes – without tools! The trunk provides copious cargo space, a padded passenger backrest and two audio speakers. Create a custom soundtrack for your ride. 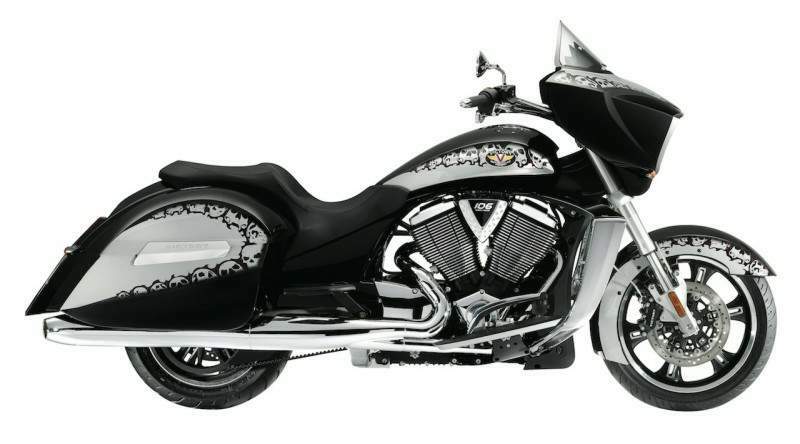 The audio system integrated in the fairing offers AM/FM radio and is MP3-compatible so you can provide your own music for the ride. Controls are mounted conveniently by the left handgrip, and a display screen provides information about the audio mode and playlist. Before arriving in Austin, my wife Jane and I were given a few photos and a brief description of the new 2010 Victory Cross Country motorcycle, so we had formed an image of what to expect. First sight of the Victory Cross Country revealed that our anticipation had not been nearly strong enough; a stunning example of motorcycle artistry greeted us. Painted metallic Midnight Cherry red, the Cross Country's sharp lines appear faceted out of cultured ruby. Angular design elements bring to mind experimental aircraft of the early jet era, yet defy placement in a specific period of the motorcycling milieu. Triangles appear scattered throughout the motif, beginning with the inverted triangle of the headlight cowl, continued in the triangle circumscribed by the cylinders with the EFI cover wedged between, and finalized in the tapered, flush-mount LED taillight. Normally, I prefer to spend some time with a motorcycle before having Jane ride with me. However, she is only in Austin for a single day, so there is little time for such formalities. Fortunately, the Cross Country proves a delight to pilot with a passenger. Its lightweight hollow cast aluminum frame, which uses the engine as a stressed member, gives the Cross Country the lowest center of gravity in its class. There is no hint of top heaviness, and the bike requires little input to prevent wandering at slow speeds. The low seat height of just over 26 inches (unladen), adds to rider control when dealing with stop-and-go traffic or walking the bike through parking lots. Possessing a map of the Texas Hill Country, I roll on the throttle. 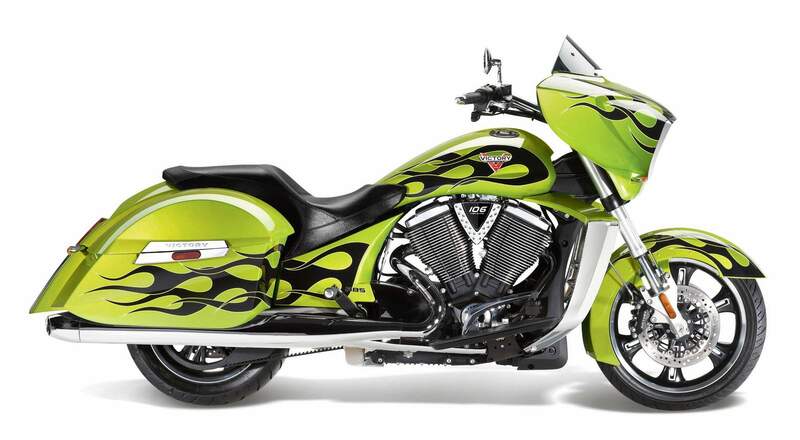 The 50-degree V-twin Victory Freedom 106 engine builds revs with a comforting growl from the split dual exhaust, effectively applying its 96 horsepower and, most importantly, 109 ft/lbs of torque to the Dunlop Elite 3 tires. 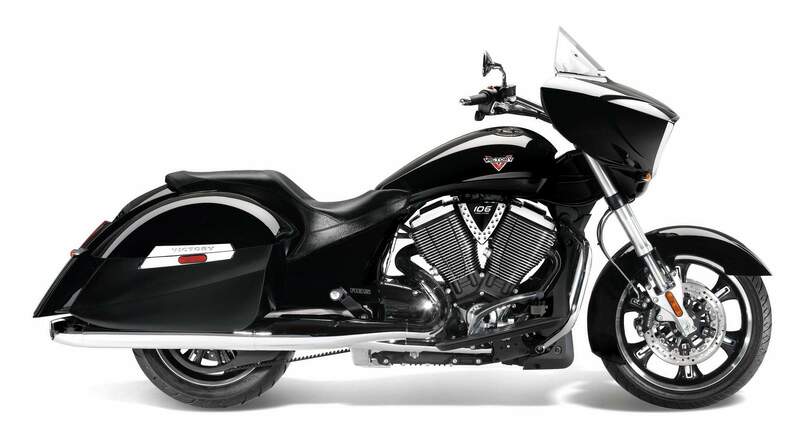 Fed through EFI with dual 45mm throttle bodies, the Victory Freedom 106 utilizes a single overhead cam with four valves per cylinder. This supplies a high volume of air through a light weight valve train, allowing the engine to produce a wide torque curve from midrange to high rpm. Engine response is superb and shifting through each of the six gears is smooth. With the state capital in the rear-views, we head into the Texas Hill Country, the region of Central Texas along the Balcones Escarpment, with Austin to the east and San Antonio to the south. The topography is rolling, sometimes rugged, limestone hills covered with oak and cedar. For our purposes, the Hill Country is a series of meandering two- and four-lane roads linking a diverse collection of small towns, each with its distinct interpretation of Texas culture while conforming to the overriding theme of rugged individualism. These wonderful little towns urge a stop to investigate and shop, making them a perfect proving ground for our impeccable touring machine. The 21 gallons of storage in the Cross Country's hard saddlebags should handle the clothing and supplies required for this trip, as well as souvenirs picked up along the way. All can be packed conveniently in the provided bag liners. The Victory saddlebags have an internal locking latch that secures the top hinged lid to the bag body. However, my overstuffing of the bag bulged the sides outward. On several occasions, the overstuffing caused the saddlebag lids to open while riding, even after I believed I had ensured that they were safely clasped. Careful packing seems to be the key to keeping the lids closed. Distance is deceiving here. Even with a 60 mph limit on many of the two lane roads, the time it takes to get between two points on the map is blissfully prolonged. Each crossroads provides new sights that must be scrutinized to determine if they require further investigation. Every dip in the road leads down to a creek running through culverts under the road with signs warning of possible flooding. Around every hill a new scent greets us, distinctly earthy and palatable. Travel by motorcycle encourages the use of all senses to envelop oneself in the environment, and the Cross Country moves us through this environment in an undisputedly enjoyable fashion. As the evening approaches, Jane and I ride the Cross Country to our one firm destination of the day, The Salt Lick Bar-B-Que, in Driftwood. The Salt Lick restaurant is a local institution, borne out by the projected two-hour wait. Buses loaded with University of Texas Longhorn fans are pulling into the expansive parking lot as we arrive. The attendant directs us to pull into an area normally reserved for employees to ensure the Victory is secure away from the throng of vehicles coming and going. The crowd is daunting but the enticing smell of smoked meat coming from the decades old pit barbeque draws us in. The Salt Lick is a sprawling complex of stone and grey woodplank buildings with a number of separate dining rooms and a large picnic area with a band. We learn from observation and overheard conversation that the trick to a quick meal is going directly to the pit house and ordering food to go. Jane and I both order a combination plate, which is prepared in a few minutes, and take our food to the picnic tables near the band. The atmosphere is lively and cheerful due to the Longhorn victory over neighboring Oklahoma. As she had been seduced by the comfort and rideability of the Cross Country, Jane reluctantly boards her flight back to California, sorry that she cannot accompany me for the rest of the trip. As a passenger, one criteria Jane looks for in a motorcycle is the smoothness with which it transitions, be it between gears or from start-to-stop and back. With a precise six-speed transmission, wet multi-plate clutch, and carbon fiber reinforced drive belt, the Cross Country scores high in this category. With its comfortable seat and backrest, it is easy for Jane to imagine herself spending the next four days with me on the Cross Country. Preparing for my ride home to California, I decided on a course from Bandera to Sonora, with as little time on major highways as possible. Bandera is an authentic cowboy town surrounded by working cattle and guest ranches and is a popular stop for motorcyclists making the circuit around the Three Twisted Sisters, the loop consisting of Ranch Roads 335, 336, and 337. I reach Bandera in time for an early lunch, so I order some food at the Dogleg Coffee House on Main Street across from the general store. While the amenities of the Dogleg are modern, the building itself is made of limestone block and looks like it could have been a jail or bank in a previous incarnation. All the shops and restaurants along Main Street are well maintained yet direct one's mind back to a time before internal combustion. Each step through town leads to a photo opportunity of some idyllic Americana. Each building looks to be hewn from the history pages of the Old West. With noontime approaching, I head west to experience some of the premier motorcycling roads offered in the Hill Country. Just past Vanderpool, Ranch Road 337 starts to climb and twist as the rolling hills gain elevation and become more severe, exposing faces of jutting limestone framed by oak and cedar. Long vistas of the land north of the Balcones Escarpment can be seen. I head down to the Frio River and the town of Leakey, where I pick up RR 336, arguably the most thrilling of the Twisted Sisters. Initially, RR 336 follows the West Frio River for a scenic ride through expansive ranges, marked by frequent cattle guard crossings, which are effectively smoothed out with the air adjustable rear suspension and the inverted cartridge forks with progressive springs; both ends offer about five inches of welcome travel. Soon, the road heads up to a broad ridge that borders the west bank of the river, and then turns into a roller coaster of two-wheeled bliss. Climbing and diving with frequent swooping turns, the scenery attempts to distract my attention away from the road, but the tarmac is too inviting. Adrenalin claws at my hand to twist harder, brake later, push for more lean. How far can I take the Cross Country? The Victory's rigid frame, sport-aware suspension, and 300mm floating rotor disk brakes with four-piston calipers give the Cross Country a carving ability akin to a much lighter bike. Too soon I am approaching Sonora and Interstate 10. I am told that riders often ride the Twisted Sisters a couple of times in a day. Unfortunately, I must keep to my schedule. The Interstate calls for a different state of mind, one that the Cross Country accommodates. The stretch of I-10 that leads out of Texas through New Mexico seems endless, but highway luxury is easily at hand without removing your grasp from the grips. Operating a trigger switch on the left handlebar with your index finger can change each mode of the trip LED display. You can flip the display to read odometer, two trip meters, average fuel consumption, average speed, fuel range, fuel mileage, and trip timer. An integrated 40-watt audio system is controlled from a set of switches inside the left grip, allowing me to set the system to AM, FM, weather band, and MP3 player. In MP3 player mode, I can select playlists or scroll through my files by album or artist. The audio system also has an auto-fade feature that permits you to set the volume while stopped, and the system will automatically increase the volume as your speed increases. Flexible body positioning is a great defense against fatigue, and the ergonomics of the Cross Country provide many opportunities for personalization. The rider's floorboards are long and offer a wide range of options for foot placement. The foot controls are adjustable to accommodate different leg lengths. Even without highway pegs installed, the forward swept wing shaped highway bars provide a nice place to push your feet against to change the pressure points on your gluteal muscles and lower back. The seat has extra padding and provides a small amount of back support. Using the standard electronic cruise control makes running the tank dry before having to stop to stretch your legs a regular occurrence. West of Las Cruces, the sky fades into the darkness of what is obviously a storm. Just before reaching the Border Patrol checkpoint between Las Cruces and Deming, I enter the brown wall of dust and rain that delineates the outflow boundary of the tempest. I angle into the heavy crosswind as much as possible, trying to dodge tumbleweeds and shrubs. The Cross Country handles the high crosswind with the same confidence it displays during normal riding conditions. A heavy downpour with hail hits just as I ride under the awning of the Border Patrol checkpoint. The large awning does not protect from the wind, but does provide some shelter from the heavy rain and hail. This gives me a chance to pull a tumbleweed out of the forks while escaping the heaviest of the downpours I encountered. The Cross Country's fairing is designed to channel rain away from the rider's hands, and adding the tall touring windscreen delivers even more protection. The next morning, clear skies and a clean Interstate 10 greet me. Motorcycling north through Arizona on US 191, I make Flagstaff for my final night on the road, leaving me an eight-hour ride across the Mojave Desert to home. Over dinner I consider the coming final day of my trip and how the Cross Country has been a consummate companion. 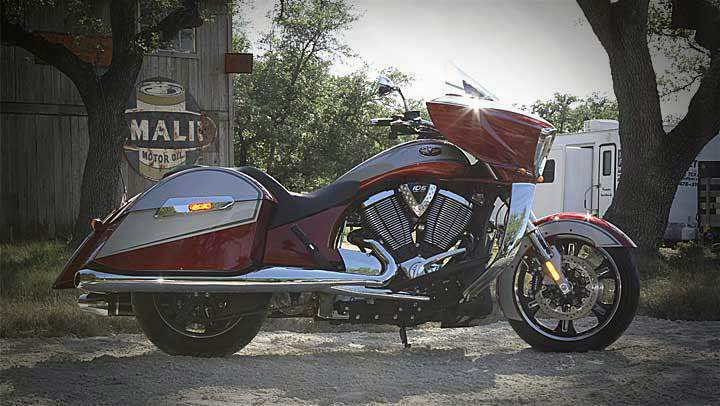 Whether riding solo or two-up, on Interstate or rural road, the 2010 Victory Cross Country is a most appropriately named motorcycle. Unique styling, well-designed accoutrements, and ample performance position this American motorcycle as one of the premier distance killers available.